Entry for MAGS November 2009, "breaking in"
The treasure hunters Joanna and Phillip are searching for the treasure "Goldbeard". Their hunt has lead them to a large cave. Inside awaits an adventure..
A quite short, but puzzle-filled game. "Gameplay is cleverly split between two playable characters, but puzzles seem arbitrary and ill-defined. Underlying design shows promise, but let down by uneven execution." 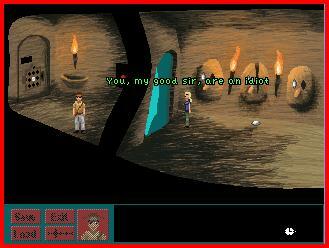 This short game has a nice atmosphere, pleasant backgrounds and well drawn main characters. However, the puzzles seem forced or simply illogical.